Ah Well--I been with Virgin for 25 years since it was ntlworld...If and when we do have a price rice I shall be leaving. Will be a sad day for me..
Kind of a silly statement, where ever you go for your internet there will always be regular price rises. If 200 tier gets a free upgrade to 300/350 then they'll have the 350 tier customers complaining, so if they do that they might upgrade those to 500. It's not that unthinkable, while we're starting to get into silly numbers in terms of sheer speeds, the uplifts in question as a percentage aren't anything unusual. 50 got doubled to 100, 100 eventually got doubled to 200. Not unthinkable for 350 to go to 500 or 200 to go to 300. My views are my own and in no way reflect those of Virgin Media. 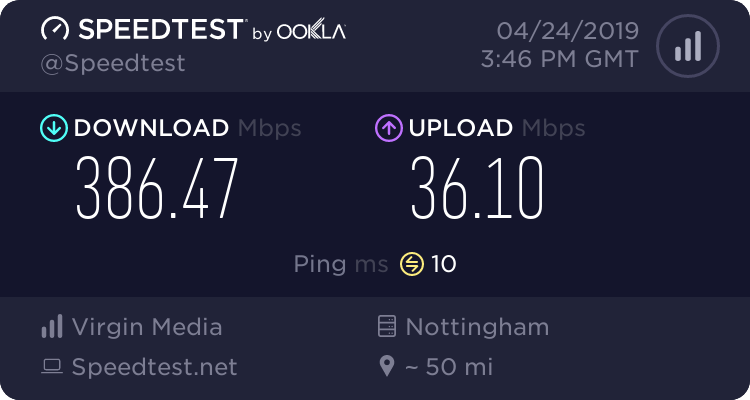 If you reboot your Hub3 you may have an upload boost to 38.5 as this has been reported today on our Upgrade thread and here. But VM are taking the urine now. If you don't need all these 'free' speed increases, there are much cheaper deals out there. After these 'free' upgrades, the price always seems to go up by more than inflation. Feel free to leave, I am sure the prices of competitors also goes up, but if speed increases across the other tiers as it usually does then people can downgrade without losing much.